My Passage to India … continues, from Delhi to Jaipur, the most beautiful and exciting city in the moghul-rich state of Rajasthan. Come and meet Kasliwal scion and world-class jewelry designer, the great Munnu Kasliwal. View his glorious newest jewelry designs, and get a first look at prized centuries-old Jaipur art from his personal collection of antique Indian miniature paintings featuring jewels of the maharajahs. 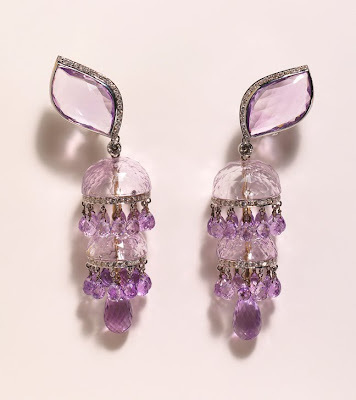 Chandelier earrings are amethyst with diamonds. The illustrious, splendiferous, and somewhat mysterious Gem Palace is my favorite place to visit in Jaipur. As soon as I arrive to stay at the Rambagh Palace hotel, I ask my driver to take me in the Maharani’s 1937 Daimler to M.I. Road. Finally I arrive at the magical Gem Palace in the center of the historic town of Jaipur. The workshops of the Gem Palace, owned by the philanthropic Kasliwal family, once made jewels for maharanis. Now their diamonds and jewels fuel the desire of European royalty, Italian fashion designers, London interior designers, German barons, Moroccan royals, Dubai emirs, and a world of gem collectors too rich, dazzling, or famous to mention. 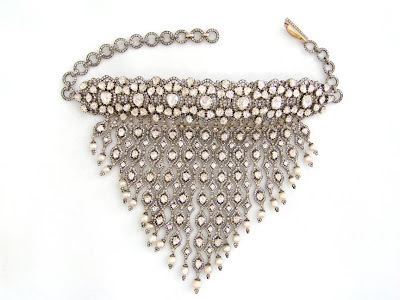 “Please try this on,” murmurs Jaipur jeweler Munnu Kasliwal, expertly draping a stunning necklace of ice cube size rose-cut diamonds and securing it just so. The ravishing diamond necklace and matching diamond earrings are followed by a maharajah’s trove of sapphire and diamond rings, a luscious diamond pave pebble pendant on a white gold chain, an emerald bead torsade, a dazzling gold snake bracelet, a lapis lazuli and turquoise Egyptian-style necklace, and a Burmese ruby necklace sparkling with diamond rondelles. The Gem Palace. Diamonds as big as the Ritz. Emeralds the size of a quail egg. It’s just another dazzling day in Jaipur, the legendary Indian city, where lavish jewels, shimmering silks, and palatial hotels that were once home to royal families are all part of the day’s pleasures. And on a warm spring day, there are historic jewel-encrusted palace rooms to visit, embroidered cashmere shawls to buy, jangling temples to quietly visit, and delicate rose-flavored pick-me-ups to savor. Munnu Kasliwal, a young son of the family that has owned Jaipur’s legendary Gem Palace for seven generations, is considered one of the top fine jewelry authorities in the world. “Jaipur was founded in 1727 as a planned city and has always had a tradition of rare handcrafted jewelry and art," noted Kasliwal, whose Munnu collections are on dazzling display at Barney’s New York in Manhattan, San Francisco and Los Angeles and other Barney’s locations around the country. Although Kasliwal has been intimately involved with diamonds and emeralds and precious stones since he was a child, he revels and delights in his newest designs. He jingles vivid orange fire opals and pink sapphires on his studio table, and takes a maharajah’s turban ornament from a silk pouch and twirls it in his hand. Only in Jaipur are precious jewels displayed with such elaborate ease. 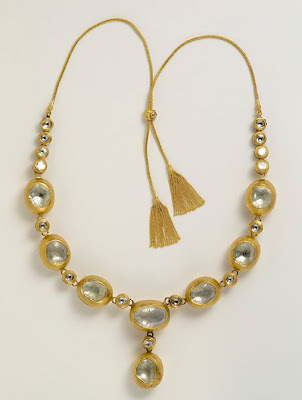 The gold necklace is set with diamonds in the traditional Indian technique of "Kundan-Meenakari" which is a style of setting the central stone with the purest form of gold, and with finely crated enamel on the reverse. I carry my Moleskin notebook with me at all times when I’m in Jaipur. Every second seems so far removed from my life in California. Days are intense, drowsily fragrant, and helter-skelter with visits to friends, and late lunches sprinkled with pomegranate seeds and spices. I want to remember everything, so I sit in a quiet and shaded corner of Munnu Kasliwal’s studio and record impressions. Outside, the daily cavalcade of life in Jaipur continues, raucous and dusty and thrilling. Monkeys sit on a shop awning, intently watching a cow sidling along the road amidst the tumult of traffic. Far below the atelier, it's rush hour and rickshaws racket along, and bicycle bells set up a cacophony of sound with bus horns and panoply of pedestrians. I’m in Jaipur. Sitting on a white linen-covered mattress on the floor at Munnu’s private atelier hidden in the top floor of the Gem Palace headquarters. Collections of old dhurrie rugs zigzag across the white marble floor in cool blue stripes. Sequined shocking pink and tangerine pillows make a vivid stab of color on antique carved wood chairs. ...Munnu unlocks the safe door, removes a metal lock box, and carefully lifts out a rumpled plastic bag--to display a newly crafted necklace of diamonds with a 125 karat emerald pendant. He holds it up to the window, where it glimmers and dazzles, and I focus on its great beauty. Rare, delicious, and highly desirable, it will appear, eventually, on the beautiful bosom of a royal lady, most likely in a rich and very private venue. ...It’s a hot afternoon in Jaipur, intense sun, and I am in my India travel uniform of custom-made white linen shirt, cream linen knotted and fringed scarf, neat black pants with a trim crease, and black Blahnik sandals. Jewelry is rather superfluous, but every day I wear my sentimental favorite, a natural white pearl necklace given to me by my grandmother. ...Munnu opens another old lock box. Inside, a rose cut old-mine diamond ring in the Indo-Russian style; pave-set diamond necklaces; drop earrings of aquamarines, smoky topaz, iolite and lapis; Burmese ruby rings rimmed with rose-cut diamonds; a pink, yellow and blue sapphire and diamond bracelet. ...On another worktable nearby are neat piles of citrines, topaz, spinels, rubies, sapphires and emeralds. The afternoon quietly passes with the unexpected visit of a friend from London, the arrival of chilled goblets filled with honey-flavored lassi, a new diamond amulet carried in from the workshop, to be checked, appraised and critiqued. ...Through an ornate window I can see that the sky is now pale blue, dotted with black crows and small red kites darting hither and thither. 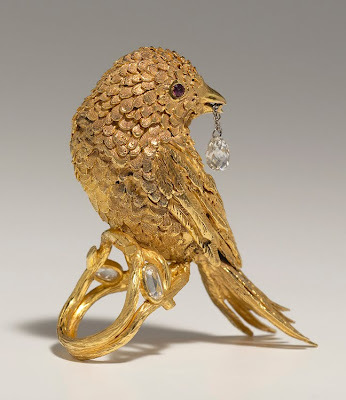 The bird is a ring and it has a diamond briolette in its mouth. Rajasthanis (the stunningly handsome people who live in this north-west province of India) are known for their love of vivid colors, gold, gems and adornment. Jaipur is now said to be the world’s center of precious stone cutting, gems and jewelry crafting. It is also the place to find exquisite shocking pink, turquoise and amethyst-colored sari silks with gold-thread borders that look so ravishing with all these jewels. 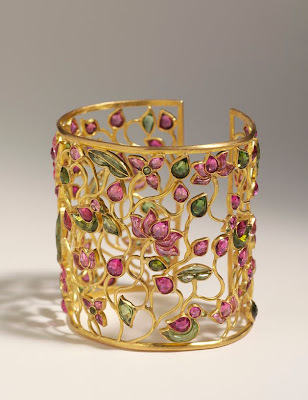 Jaipur is home to diamonds and museum-quality emeralds and sapphires, as well as traditional tribal silver jewelry, and armfuls of lacquer and crystal bracelets for the princely sum of $1 each. In Jaipur’s fashion salons, it’s possible to find exquisite beaded and embroidered dresses by India’s top fashion designers that are often the wedding gowns of nobles—worn with heirloom-quality Gem Palace Indo-Russian-style diamond chandelier earrings. To luxuriate in the treasures of Jaipur, visitors may spend mornings at City Palace (home of the current maharajah and his family) or the Amber Fort. Then it’s on to lunch on the marble terrace at the Rambagh Palace Hotel, with a visit to the hotel's bookshop to find armfuls of books on Indian jewels and costumes. Later a driver will assist in the hunt for sandals and silks in the cacophony of Johari Bazaar. My late afternoon hours are whiled away at the Gem Palace with perhaps a cup of spiced tea or chilled filtered water for a pick-me-up. Sanjay Kasliwal, one of the charming brothers who own this company, will uncover drawers full of cabochon rings or bring out a series of aquamarine bead necklaces or more informal labradorite necklaces. Jeweled and bedazzled, and draped in silks, visitors to Jaipur are dazed and seduced by the beauty. And on the visit’s last afternoon, a stop at the Gem Palace is de rigueur. One more tourmaline ring. One more topaz torsade or citrine bracelet. Departures from this raja’s world will certainly be reluctant—but there will be more magic on a return visit. Still today in Jaipur, there are neighborhoods of stone carvers, silk embroiderers, block printers, sandal makers, diamond cutters, wedding gown seamstresses, and jewelry crafters. 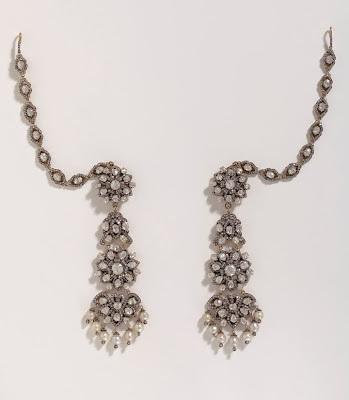 Mughal rulers encouraged jewelers, weavers, artists, stone carvers to come to the city from Persia and further East. This family-owned jewelry establishment, like other jewelers in Jaipur, was founded in the eighteenth century to custom design for the rarified whims and ceremonial demands of maharajas and their maharanis. The brothers and cousins of the Kasliwal family now continue this illustrious tradition of connoisseurship. 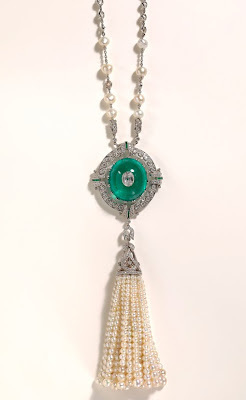 The Gem Palace’s emerald and ruby necklaces and diamond rings have been avidly collected in days gone by by crowned heads of Scandinavia, the Viceroy of India and Lady Mountbatten, Middle-Eastern nabobs, as well as devoted fans like Giancarlo Giammetti, and Prince Charles with first the Princess of Wales and later the Duchess of Cornwall. Visitors enter a series of mirrored antiques-filled rooms and discover pretty citrine rings for around $300 and Colombian emeralds rings, Burmese ruby pendants, or vivid sapphire necklaces for out-of-this-world prices. Indian miniatures exclusively shown here for the first time. Eighteenth- and nineteenth-century handpainted miniatures, a tradition in Jaipur, are all from the private collection of Munnu Kasliwal, Jaipur. Used with express permission. Jewelry images exclusive to THE STYLE SALONISTE, Eric Duroo, used with permission. So much fun to read this. Makes me want to put down my work and head for the airport. so informative. the jewelry is drop dead gorgeous. 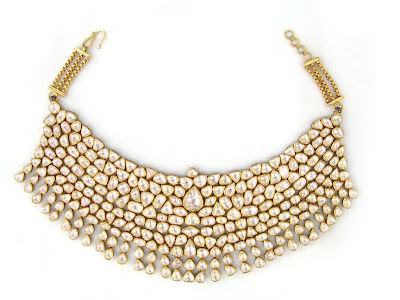 I'm so so in love with the "Kundan-Meenakari" necklace! Can I have it ;)? Goodness, its blunt comment, but your writing about your time spent in Jaipur is absolutely wonderful! I am going to revisit this with more time and also Matisse which I missed because I was getting your posts. With this post you made us all dream!!! WOW - this is the most amazing post. In 2007, I visited Jaipur and Gem Palace, which was the highlight of my trip to India. The beauty of the designs and styles is astounding. Wonderful to hear from you--Pamela (and Edward), Style Curator, Patty, Lesley, Robert (so glad you caught up), and Greet (hi, in Belgium), and Tina--and Karen! 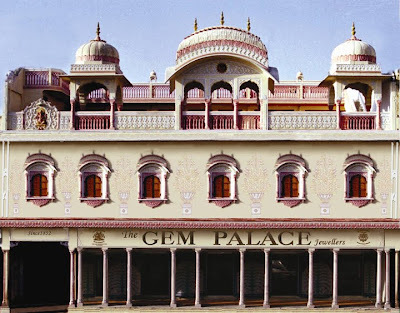 I am so happy you found THE STYLE SALONISTE and found this new feature on GEM PALACE in Jaipur. As you can see, I adore India--and Gem Palace and all of its staff and talent and family--are sa distillation of all that is wonderful about India and jaipur. It's a happy place, it is vivid, it is fast-moving, and both are vibrant and lively and surprising and witty and unexpected. Stay in touch. I have somemore surprising and wonderful features in the works...stories from around the world. Lovely to hear from you--from the heart of Provence. I have enjoyed your peregrinations around Paris, and loved your tips of romantic places and restaurants. I am looking forward to your day to day experiences around St Remy as well...always dreamy. You have transported me back to my visit to Jaipur, the scent of Jasmin in the lobby of Rambagh Palace, the temptations of the bazaars, and the experience of some of the most incredible jewelry around my neck, on my wrists and fingers, which I sadly had to return. Thank you! Thank you so much for your kind message--and thoughts and memories of India and the scent of jasmine. Jaipur and Delhi are indeed fragrant and romantic. And...just to see the diamonds and tribal silver and vivid silks for a moment is a pleasure. I asked a friend about the cows wandering around Jaipur, which has a lot of traffic, and she said that these cows all have 'homes' and that at night, after browsing and wandering and eating all over the city, the cows return to their 'dairies'...where they sleep overnight...before heading out in the morning. Fascinating. What a wonderful post. I feel closer to India each time you write about it, and I am yet to visit there. Your passion for your subject is infectious. You are truly an inspiration. What a pleasant and exotic visit I have had here. I think I shall have visions of colorful Jaipur and exquisite jewels dancing in my head indefinitely. Oh, to expand my horizons and journey to this land I have only dreamed of. I dearly thank you for taking me along on your enviable journey with words that paint all the delights I have imagined and more. What a gift this is to have joined you. And thank you so very much for visiting my little world and leaving your gracious comment. I shall return often hoping to be swept away with your delightful commentary. Hi, I'm a journalist and planning to go to Gem Palace this weekend and meet Munnu Kasliwal. Was just reading up on the place and the person, when I came across your article. The piece on gem palace is really fabulous!! I could just see everything you wrote about. I've been to Jaipur twice (in my childhood) and this will be my third time.But I saw it as a very different place through the eyes of a non-native person.... Amazing descirption. Loved it!